For NaNoWriMo, I’m writing a middle-grade fiction novel about a boy who loves aliens. Here’s an update on my progress, and the state of my writing. It’s random. I’ve been working a few shorter pieces at the same time, and a philosophy paper, this month as well. 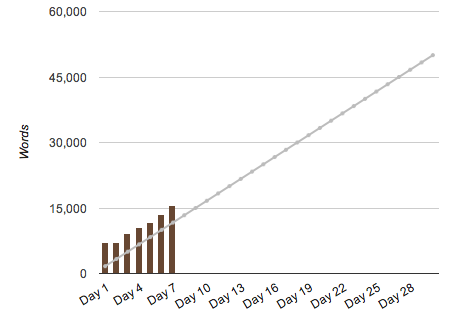 Since I’m not counting this writing into my NaNoWriMo word count, I give myself leave to edit them at will. Its so luxurious to write slowly and carefully, considering every move and transition. I don’t know if the output is actually better, but it feels weirdly freeing to edit as I go, which I think is the opposite of what most people would say. According this blog post by Patrick Rothfuss, this means I’m breaking all of the rules. Oops. But then I read stuff like this by Christian Mihai, and I’m all inspired to get back on track. I have learned that when I don’t look back and consider things carefully, I sure can power out some awful drivel. Editing may be slow, but its also vital. I can’t decide if powering through like this is going to be worth it in the end if I have to go back and essentially redo everything. I might have to reconsider what are turning into major plot points. Would I create a better storyline if I were to edit as I go? I feel like some of my plot decisions are hasty, lazy, and clumsy, and they have such a strong influence on what comes next. So I worry. I’ve also discovered that, left unchecked, I can really drag things out. I currently have the pacing of a particularly slow British period drama. So many words go by before anything happens, and honestly, almost nothing has happened for a long while. It’s like Ladies in Lavender over here (it’s a great movie, and I love it, but it’s not exactly a car chase adventure). I’m not sure I have any better shot at finishing my novel this way than if I were carefully editing. But then, I think: it’s worth it. I’ve discovered some new plot points I had never considered, and they’re turning out to be totally necessary for the story in a way that’s kind of great. It’s not all clumsy. I think I like the outline that’s emerging. And my stats look pretty awesome.